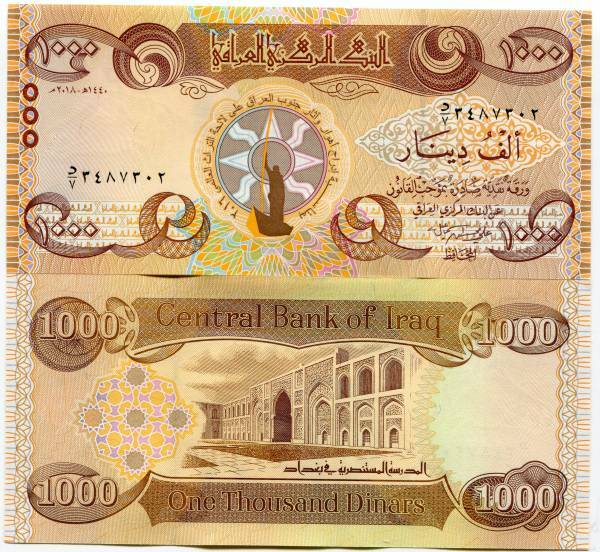 1 000 New Iraqi Dinars 2018 with New Security Features - Assyrian star in middle , this is the latest issue version of the older 2003 5000 Note , with a new date (AH 1440) - 2018 and additional security features like the SPARK® color changing element and Braille Embossing for the Blind . There are additional features visible under ultra violet (black light) in addition to the micro fibres that were used on the 2003 notes . All notes are UNCIRCULATED .